Chicago: University of Chicago Press, 2015. 240 p. $45.00. 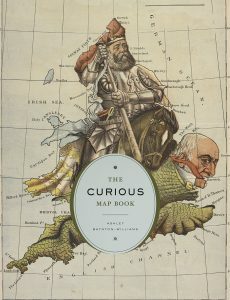 The Curious Map Book, by Ashley Baynton-Williams, presents a collection of historic maps that are more unique and unusual than the typical utilitarian variety. The majority of the curious maps showcased by Baynton-Williams, an antiquarian map dealer, reside in the collections of the British Library in London. Here you will find reproductions and descriptions of fictional maps, maps in human form, maps as allegory, and the occasional straightforward reference map with an odd backstory. This monograph is broad enough to appeal to a general audience, map and history enthusiasts, or to professoriate seeking a text to accompany class assignments. One hundred maps are featured in The Curious Map Book, presented in the chronological order in which they were published, beginning with the ‘Ptolemaic Map of the World’ drawn by Hartmann Schedel in 1493. The book is divided into four main sections: The Dawn of Mapmaking (to 1594), Early Published Maps (1598–1760), Commercial Cartography and Education (1760–1850), and The Victorian Era and Growth of Mass Market (1850–). In a short introduction, Baynton-Williams discusses themes that arise throughout the book such as game maps, zoomorphic and anthropomorphic maps, allegorical maps, and maps on objects. After reviewing the book in its entirety and revisiting the introduction, I found myself wondering if the content might be better organized in these thematic groupings rather than in chronological order. The chronological format takes nothing away from the book and its content, but occasionally results in odd clustering of themes. The book quickly settles into a standard format of a map presented on the right-hand page with an accompanying essay on the left-hand page. The essays typically describe the cartographer or publisher, and provide the historical context under which the map was drawn. It is worth noting here that precious few maps are provided the comfort of a two-page spread –most are confined to a single 8.5” by 11” page, preventing the reader from examining the finer details of some images. Although the image quality is high, small scale maps (of which there are many) often contain details referenced in the essays that are nearly illegible on the maps themselves. This circumstance was a frequent reminder that I was working with a secondary source, inciting a desire to see the original printings in all of their glory. With that in mind, the book, with its intriguing examples and commentary, would make a great accompaniment to an exhibit of historic maps for a public group or class of college undergraduates and could serve as an entry-point for more in depth inquiry. Many of the maps featured in The Curious Map Book could serve as starting points for thoughtful discussion about propaganda, symbolism, cartographic representation, or even morality during the European Renaissance. From an aesthetic perspective, some of the most pleasing of the earlier examples are a series of maps of the European Low Countries (modern Belgium and the Netherlands) represented as a lion. Zoomorphic maps like these, as well as the anthropomorphic maps, are the most intriguing in the book. As the majority of the maps were drawn by Londoners, it is interesting to compare how the representations of different European nations changed over time as they fell out of favor with the British. For example, Ireland is represented quite fairly as the Lady Hibernia Bull on ‘Geography Bewitched! Or, a Droll Caricature Map of Ireland,’ from 1793 (p 110), but later on Ireland reappears as a dog on a leash (p 175) and an abusive woman (p 195). My favorite section of the book is the Victorian era maps, where political themes begin to arise. The caricature maps depicting the various wars of 19th and early 20th Century Europe are interesting snapshots into the geopolitics of that volatile period. The British view of eastern European nations is readily apparent here with Russia typically caricatured as a dangerous bear or octopus –not unlike its depiction in political cartoons of recent times. A fair criticism of this book is that its scope is limited mostly to Western Europe. Nearly all of the maps found here were drawn in England or a few other northern European countries. Of the one-hundred maps featured, only two are non-Western: a Japanese produced map of Europe (p 196) and an Afghanistan map-rug seemingly tacked onto the final page as an acknowledgement of other cultures (p 224). This narrow scope could simply be a product of Baynton-Williams focus on the collection of the British Library, although it seems reasonable that the library’s vast collection holds examples from across the globe. The book also ends with a bit of a whimper, skipping from the 1930s to one map from the 1950s to the final map from 2008. The World War II and Cold War eras, which one would expect would have been ripe with curious maps, are overlooked entirely. The Curious Map Book is a great choice for the map-curious. Any of the book’s shortcomings would likely be overlooked by all but map librarians, cartographers, academic geographers or historians, and the like. The book is intended for a broad audience with a general interest in maps and history. In an academic setting, its best use would be that of an entry point for further inquiry, as it has excellent examples of political satire and cartographic bias. Any of the maps featured here would integrate well into undergraduate geography assignments. For the more advanced researcher, consider it a light-hearted foray into the whimsical side of map history.